The concept behind the Madison County Women’s Giving Circle, now preparing to wrap up its fifth year of giving, is simple: 1) Gather up and create a membership of women who care deeply about organizations and projects that promote dignity, equality, and opportunity for women and children in our county. 2) Ask them to meet quarterly for one hour to hear presentations from those who are actively working to help others in our community and need some cash to make it happen. 3) At the end of each meeting, have each member vote to decide which of the presenting organizations will receive the funds for that quarter. 4) Tally the votes, determine a winner, and collect checks for $50 apiece from each member (made out directly to the winning organization). 5) Watch as the amount per quarter escalates to an impressive $5,350 from 107 active members! On Saturday, November 19th, several members of the Giving Circle’s Executive Committee (Ester Mae Cox, Pat Nelson, and Paulette Hice, pictured above) went to Wildwood Hills Ranch to award their 3rd quarter collected funds of $5,350 to assist with scholarships for students to attend leadership retreats, such as the one that was in progress during their visit. Wildwood Hills Ranch of Iowa, located between Winterset and St. Charles, exists to transform lives and strengthen communities by providing healing, hope and God’s unconditional love to children and youth at risk. 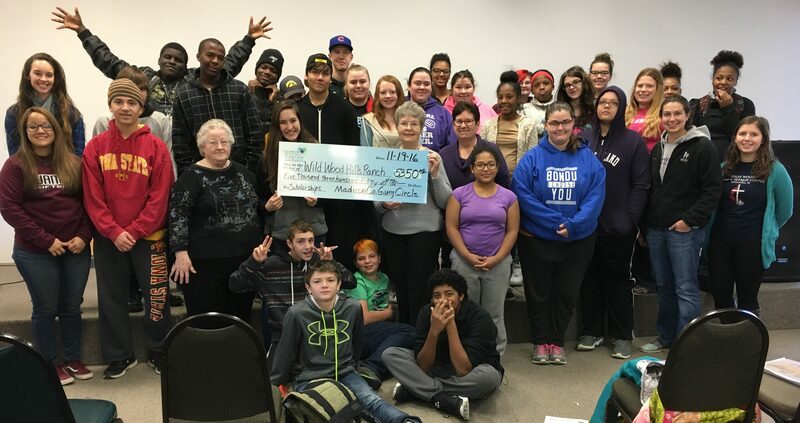 Earlier this year the Giving Circle also awarded $5,150 to the Crisis Intervention & Advocacy Center and $5,175 to the Winterset Skate Park. Truly, it seems that the uncomplicated nature of the program is a large part of its success. The meetings are, and always have been, held on the fourth Tuesday of March, June, and September (with a special meeting in November or December) at 6:30 pm at the Sports Page restaurant in Winterset. Those who wish to eat with the group can go at 5:30. Also, they have a process in place to keep presentation times equal and the length of the meeting to one hour, with plenty of time for discussion and Q&A with the presenters. Projects that benefit women and children in Madison County are especially encouraged, although non-gender specific requests may also be considered. Those who wish to request funds just need to show up to a meeting and indicate a desire to speak. Three presentations are heard at each meeting, so if more than three organizations show up, three will be drawn at random. Those who aren’t drawn can try again the following quarter. This is from a Giving Circle meeting a few years ago, but the scene is still much the same! 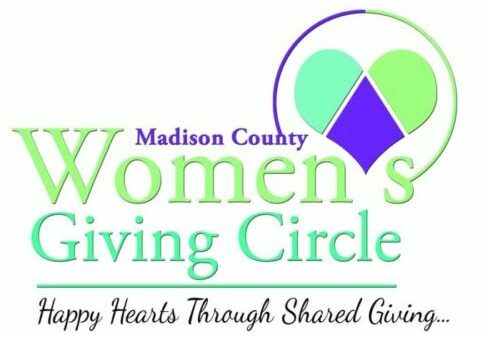 The fourth quarter meeting of the Madison County Women’s Giving Circle each year is special. It is a social event to celebrate their ongoing work, and quarterly funds are put toward a permanent endowment that was established under the Greater Madison County Community Foundation. This year, that fourth quarter meeting will take place on Monday, December 5th from 6:00 to 8:00 pm at Jacque Mohs’ Party Barn, 1899 Nature Court in Winterset. Jacque is a member of the group’s Executive Committee, along with Paulette Hice, Laura Bertelson, Ester Mae Cox, Johna Sullivan, and Pat Nelson. If you haven’t been part of this group but are interested to check it out, you are welcome to attend! Meeting dates for 2017 are set for March 28, June 27, and September 26. New participants are welcome and encouraged to attend those also. Thank you to the Madison County Women’s Giving Circle for $76,890 in total giving to the community since 2012! Purchasing Christmas gifts is a practical impossibility for families who are struggling financially. To ease this burden, Alabaster Ministries is hosting their annual Absolutely Free Christmas Store on Saturday, December 10th at the Jackson Building in Winterset. Alabaster Ministries is a local non-profit, multi-denominational group of caring hearts. They are partnering with local agencies to serve families in need during the Christmas season, providing them the opportunity to select items to give as gifts, free of charge. To help make that service available, they are looking for donations of new or gently used clothing, toys, home decor… anything that could be given as a GIFT to loved ones. Alabaster Ministries representatives will also be there to wrap packages before shoppers leave with their items, so they’ll be ready for Christmas. If you would like to help, the drop-off time for donations will be Friday, Dec 9th from 4-7 pm at the Jackson Building. If that time doesn’t work for you, find Alabaster Ministries on Facebook and send a private message to inquire. 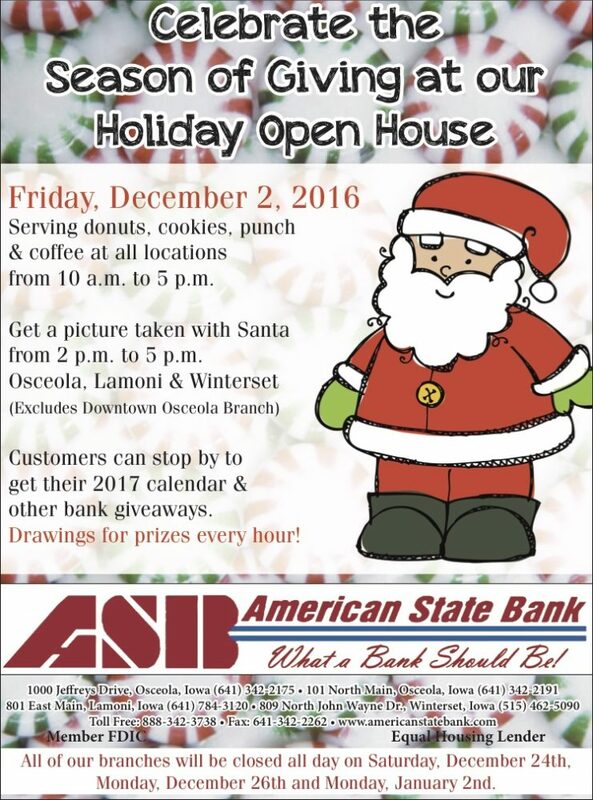 Going on right now at American State Bank, 809 N. John Wayne Drive: a Holiday Open House! 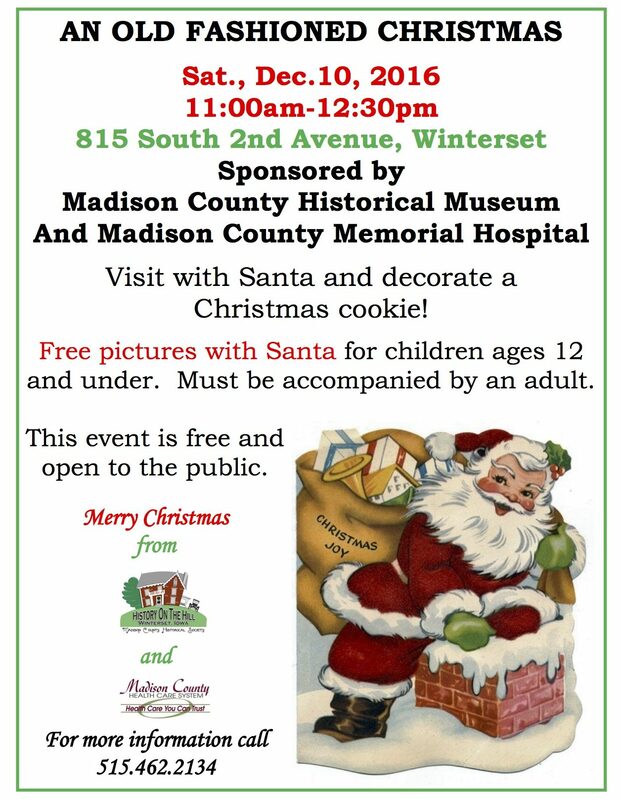 Don’t miss Santa this afternoon from 2:00 pm to 5:00 pm. And, re:home is open now, too! 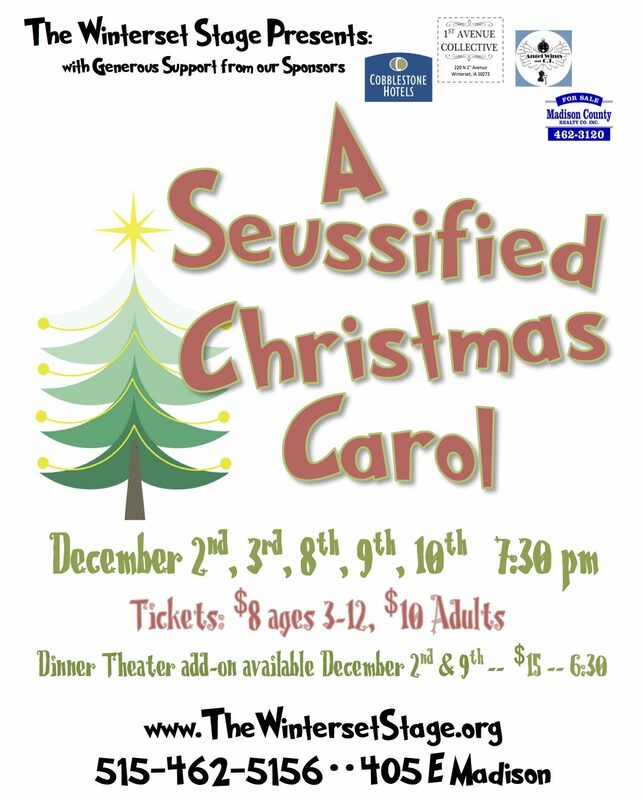 “A Seussified Christmas Carol” debuts at The Winterset Stage TONIGHT at 7:30 pm. It will also be performed tomorrow night, December 3rd, and again on December 8th, 9th, and 10th. They’ll have a festive dinner theater option on the 9th. Celebrate the holidays with a little Charles Dickens mixed with Dr. Seuss! Reserve your tickets in advance by visiting www.thewintersetstage.org/maintstage. Tomorrow, Friends of the Library will host the Library’s Holiday Open House in the lobby of the library from 10:00 am to Noon. 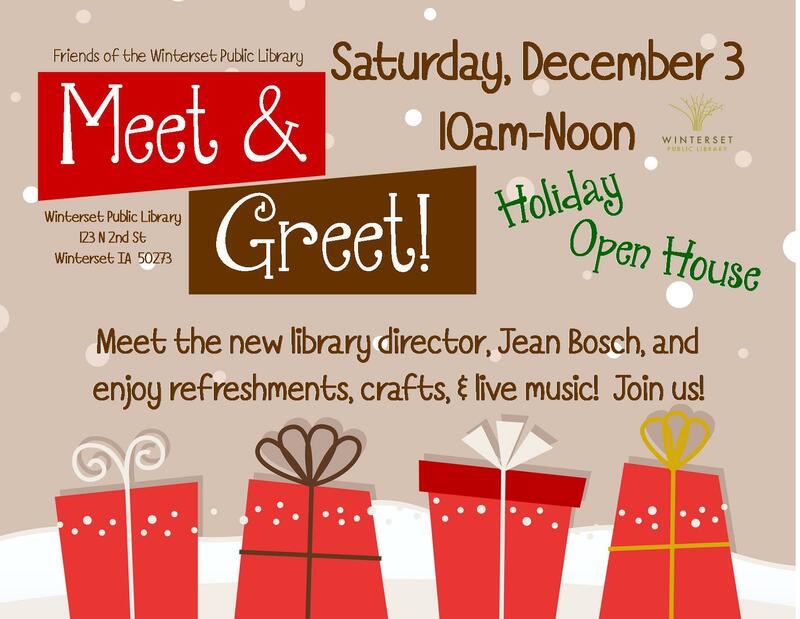 Meet the new Library Director Jean Bosch; drop in for a cookie, some hot cider, and a warm greeting! 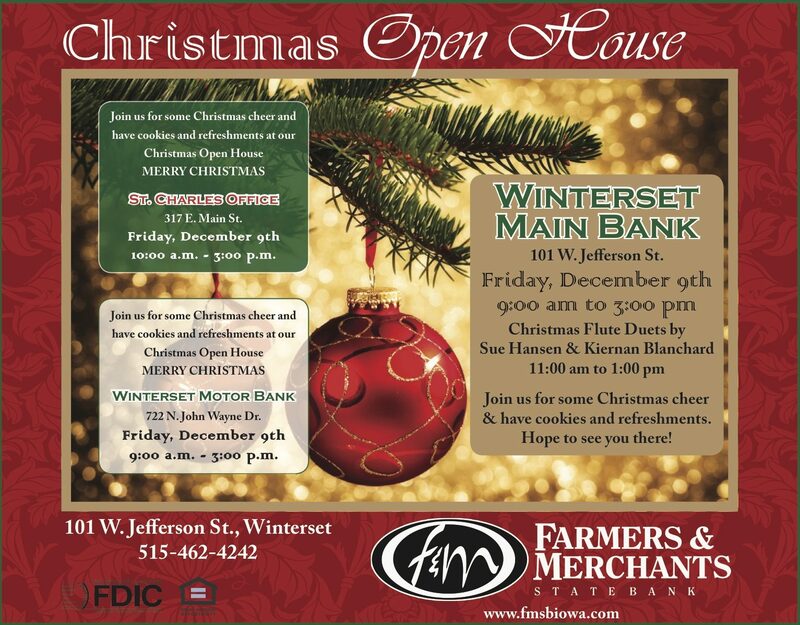 Visitors of all ages may stop and relax during this busy holiday season while listening to some of Winterset’s musicians sharing their talents. 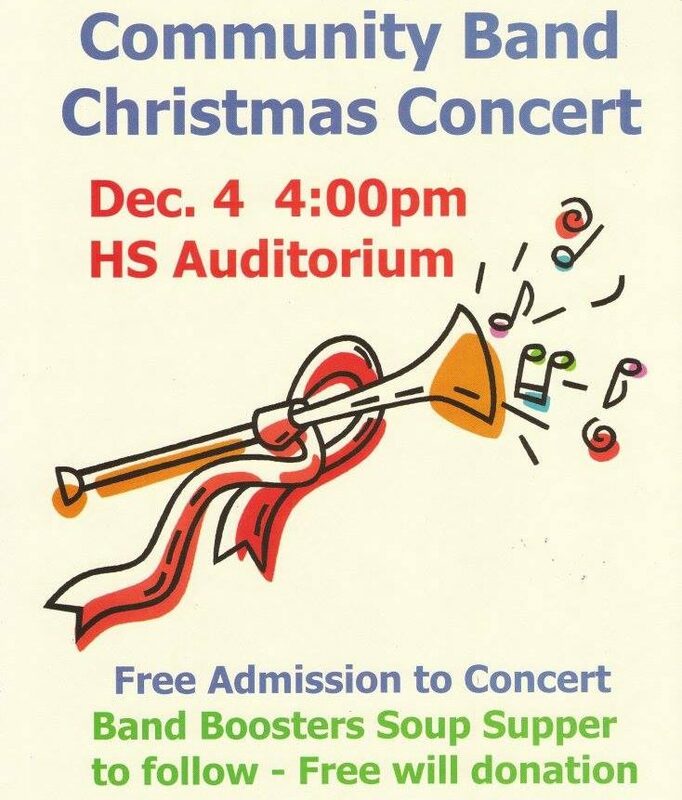 Sherry Briney will play the piano at 10:00 am, and Sue Hansen will play the flute at 11:00 am. They will have simple holiday crafts available, as well as puzzles and games. The music will also continue next Saturday with Joleen Jorgensen and Clarice Blanchard on piano (at 10:00 and 11:00 am), and Vince & Vicki Jackson (chimes) and Sam Nau (euphonium) on December 17th. 1st Avenue Collective is a great place to shop for one-of-a-kind handmade gifts, but they also offer regular opportunities to learn to make your own. Prior to Christmas they have at least three opportunities for jewelry-making: a Tree of Life Pendant class this Saturday, December 3rd from 1:00 to 3:00 pm, a Basic Earring Design class on December 10th from 1:00 to 3:00 pm, and a Forged Bracelet class on December 17th from 1:00 to 3:00 pm. 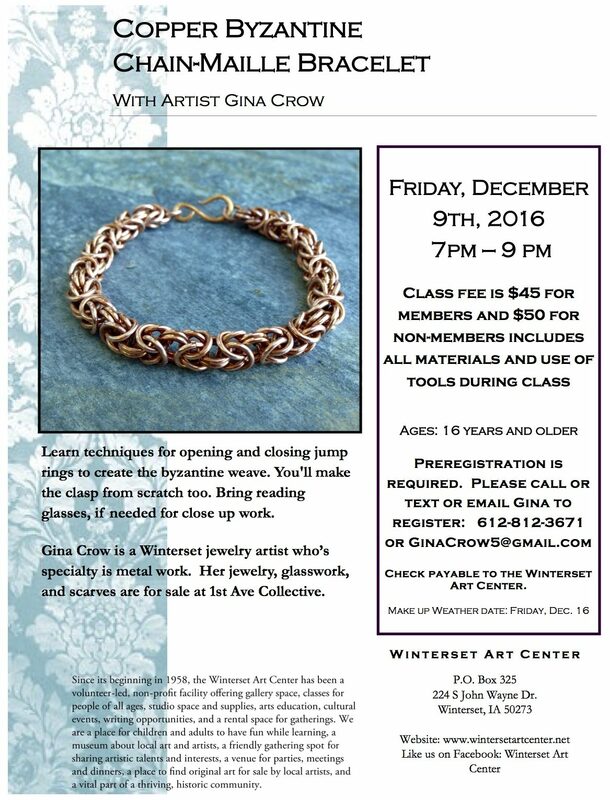 All three classes are taught by local artists Gina Crow and Sandra Geronimo. 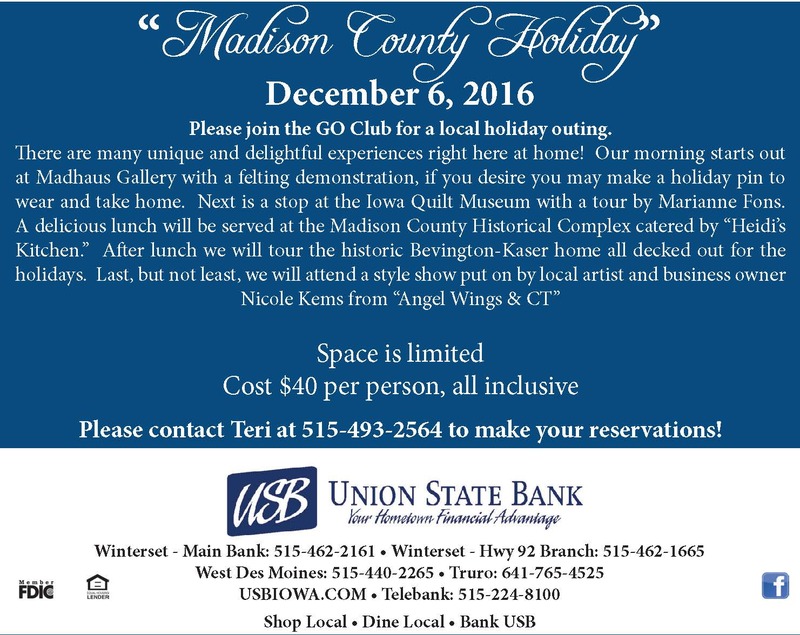 Class capacities are limited, so call 515-505-4396 to register. More information can also be found on their website, www.1stavenuecollective.com. 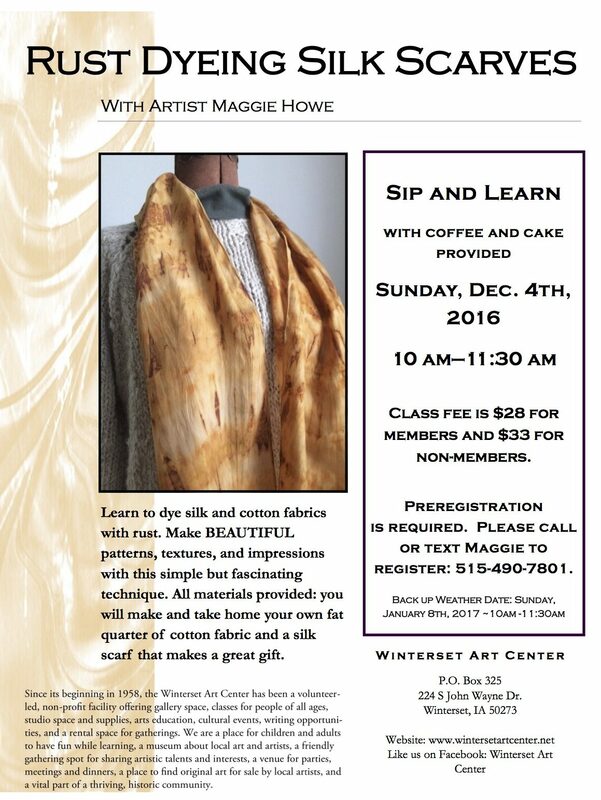 The Winterset Art Center is offering a class this Sunday. Rust Dyeing Silk Scarves will be held on December 4th from 10:00 to 11:30 am, with artist Maggie Howe. Join quilter Tony Jacobson at Piece Works Quilt Shop on December 10th for his Ombré Madres quilt class. This simple quilt project is a great quilt for a last-minute gift. 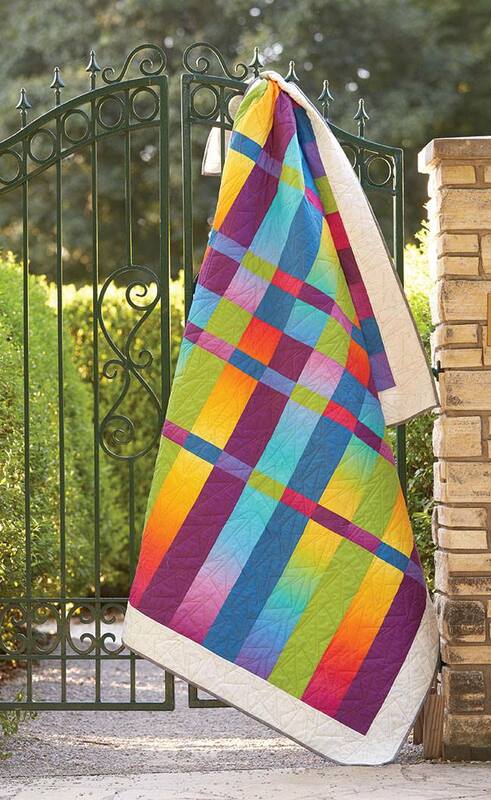 Three ombré print fabrics, three solids, and a border make this a quilt that can be done in a day. Come prepared to get this quilt top completed in class; 10:00 a.m. to 4:00 p.m. The class fee is $25. Those who have taken a December class from Tony in the past know that he likes to have a little Christmas fun along with teaching! Contact Piece Works Quilt Shop at 515-493-1121. Finally, congratulations and thank you to the Winterset High School Student Council for packaging 10,000 (47 cases) of apple cinnamon oatmeal packages for our community in November. 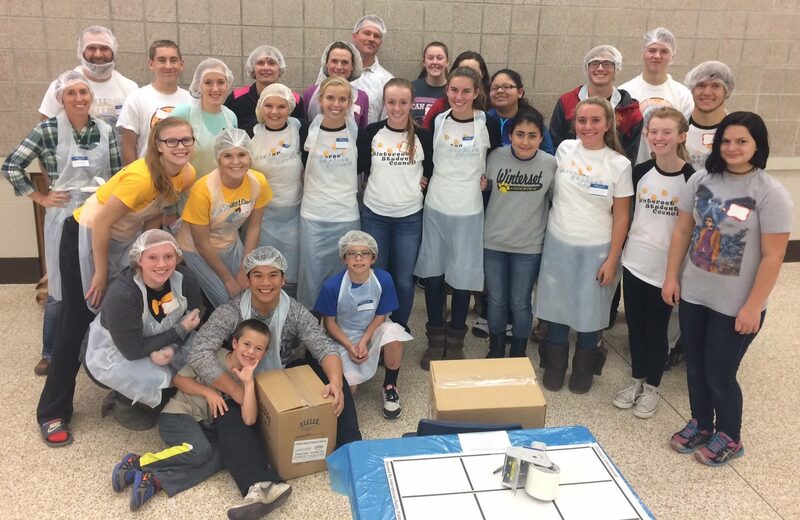 Not only did they spend a Sunday to do it, but they actively worked to raise money for two years to bring this meal packaging opportunity to Winterset. Many of the packages have now been spoken for by local pantries, but contact teacher (and student council sponsor) Jessica Gibbons at the high school if your local pantry or church is in need of some meals to to stock your shelves. They’ll give them away until they’re gone.